Name : Hasan (a.s.) – the 2nd Holy Imam Title : al-Mujtaba Agnomen : Abul-Mohammad Father : Imam Ali(a.s.) – the 1st Holy Imam Mother : Bibi Fatima Az-Zahra(s.a.) bint-e-Mohammad Rasool-Allah(pbuh&hf) Birth : At Madina on 15th of Ramzan 3 AH (624 AD) Death : In Madina at age 47, on 28th of Safar 50 AH (670 AD) Cause of Death/Burial : Martyred by means of poison and buried in the cemetry of Baqi in Madina. 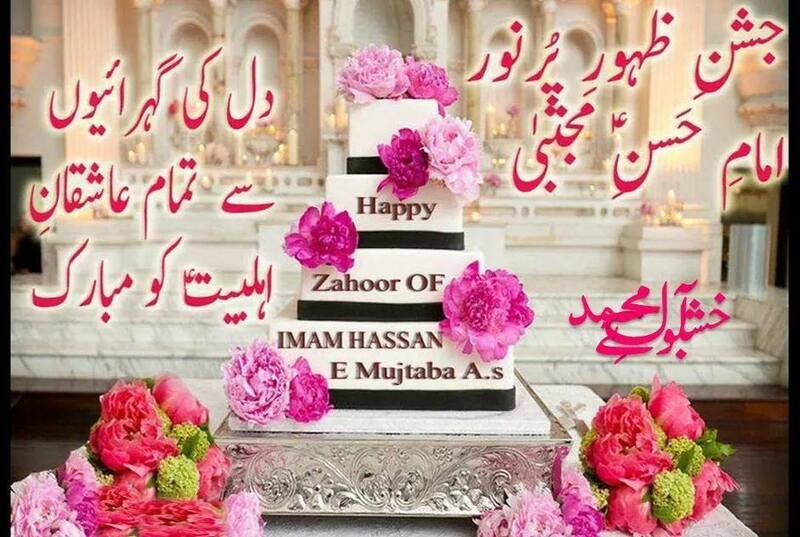 His Birth and blessings The 2nd Imam after Imam Ali(a.s.) was his son Imam Hasan(a.s.), the son of the mistress of the women of the worlds, Bibi Fatima(s.a.), daughter of Prophet Muhammad(pbuh&hf). Imam Hasan(a.s.)’s kunya was Abu Muhammad. He was born in Medina, on the night of the 15th day of Ramadan, three years after the hijra (624 AD). When Imam Hasan(a.s.) was born, the Prophet(pbuh&hf) took him and said the adhan (call to prayer) in his right ear, and said the iqama (words similar to the adhan) in his left ear. Then he sacrificed a ram for him (in the ceremony of aqiqa). Then he shaved his hair. He (i.e., the Prophet(pbuh&hf)) gave silver equal to his hair. 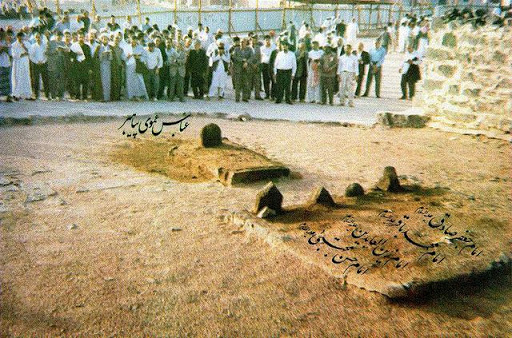 So the weight of Imam Hasan(a.s.)’s hair was a dirham and some of silver. Then he ordered his hair to perfumed. So the aqiqa and giving alms as equal as the weight of hair have become Sunna (an act of the Prophet(pbuh&hf)). Bibi Fatima(s.a.) brought her two sons, Imam Hasan(a.s.) and Imam Hussain(a.s.) to the Apostle of God(pbuh&hf) at the time when he was suffering from the sickness from which he died. “Apostle of God,” she said, “these are your two (grand) sons. Give them something as an inheritance”. “As for Hasan,” he replied, “he has my form and my nobility. As for Hussain, he has my generosity and my bravery. ” His other Names al-Sibt, al-Sayyid, al-Zaki, al-Mujtaba, al-Taqi. His Wives Imam Hasan(a.s.) married Umm Ishaq bint (the daughter of) Talha b. `Ubayd Allah, Hafsa bint (the daughter of) ‘Abd al-Rahman b. Abu Bakr, Hind bint (the daughter of) Suhayl b. `Amru, and Ju’da bint (the daughter of ) al-Ash’ath b. Qays, whom Mu’awiya tempted to kill Imam Hasan(a.s.). So she killed him with poison. His Children Imam Hasan(a.s.) had fifteen children, both male and female: Zayd, Imam Hasan(a.s.), `Amru, al-Qasim, `Abd Allah, `Abd al-Rahman, Imam Hasan(a.s.) al-Athram, and Talha, Umm Imam Hasan(a.s.), Umm al-Husayn, Fatima, Umm Salama, Ruqayya, Umm `Abd Allah, and Fatima. His Characteristics No one was more like the Apostle of Allah, may Allah bless him and his family, than Imam Hasan(a.s.) in form, manner, and nobility. Imam Hasan(a.s.) has been describe as : “He had a white, reddish face. He had black eyes, smooth cheeks, thick beard, and curly, plentiful hair. His neck was as white as a jug of silver. His body was good. He had large shoulders, and big fleshy bones. He was of medium height; neither long nor short. He was handsome; the best of all people in face”. His Ethics Imam Hasan(a.s.)’s ethics were excellent examples for people. So everyone respected him. Everyone loved him when he associated with him. When his friend or his enemy heard him talking or delivering a speech, he was sorry that he (Imam Hasan(a.s.)) would end his talking or his speech. Muhammad b. Ishaq said: “After Allah’s Apostle, may Allah bless him and his family, no one had a high social position as Imam Hasan(a.s.) had. (Mats) were spread out at the door of his house. When he came out and sat, the street was over crowded. So no one of Allah’s creatures could pass to show respect for him. When he knew that, he stood up and entered his house. So the people could pass.” Although Imam Hasan(a.s.) had a high social rank, he was kind to people. One day he passed by poor persons. The poor persons were sitting on the ground. There were pieces of bread before them. They were picking up the pieces of bread and eating them. When they saw Imam Hasan(a.s.) they said to him: “Son of the Apostle of Allah, come to lunch!” So he dismounted his camel and said: “Indeed, Allah does not love the proud.” He began eating with them. Then he invited them and gave them food and clothes. The following are some examples of Imam Hasan(a.s.)’s generosity: A man came to him and asked him for a need. He (Imam Hasan(a.s.)) said to the man: “Write your need on a piece of paper and submit it to me.” The man submitted his need to him. He (Imam Hasan(a.s.)) doubled the man’s need. So some of those who were sitting with Imam Hasan(a.s.) said to him: “Son of the Apostle of Allah, the blessing of the piece of paper was great for the man.” So Imam Hasan(a.s.) said: “Its blessing for us is greater, for Allah has made us appropriate for doing good. Do you not know that doing good should be optional, namely without request. As for him whom you give after the request, you give him after he has lost face. He may spend his night restless and sleepless. He rocks between despair and hope. He does not know whether he will face a sad answer or a glad success. He comes to you while he shakes all over and his heart is afraid (of you). Then if you met his need through losing face, that (losing face) would be greater than what he has obtained from your favor.” Imam Hasan(a.s.), gave a poet some money. So one of those who were sitting with him said to him: “Glory be to Allah! Do you give the poet who disobeys the Merciful (Allah) and tells lies?” Imam Hasan(a.s.), peace be on him, said: “Servant of Allah, the best of your money is what you spend to protect your dignity. It is an act of kindness to avoid the evil.” A Bedouin came to Imam Hasan(a.s.) and asked him for a need. So Imam Hasan(a.s.) said: “Give him all the money in the safe.” There were twenty thousand dirhams in the safe. All the money was given to the Bedouin, so he said: “My master, do you not let me tell you about my need and praise you?” Imam Hasan(a.s.) began saying: Our gifts are many, The hopeful enjoy them, Our selves give generously before the request, For fear of losing face. One day Imam Hasan(a.s.) saw a black boy. The black boy was eating a piece of bread and giving a piece of bread to his dog. So Imam Hasan(a.s.) said to him: “What has made you do this?” “I feel shame of my dog when I eat and do not feed him,” answered the black boy. Then Imam Hasan(a.s.) said to him: “Do not leave your place till I come to you.” At that moment Imam Hasan(a.s.) went to the black boy’s master. He bought the black boy and the wall (the garden) where he lived. He freed the black boy and made him possess the wall. His Outstanding Merits Imam Hasan(a.s.) is the Lord of the youth of Heaven. He was one of the two persons in whom the progeny of the Apostle of Allah, may Allah bless him and his family, was limited. He was one of the four persons through whom the Prophet(pbuh&hf) made the contest of prayer with the Christians of Najran. He was one of the five persons whom the Prophet(pbuh&hf) covered with his cloak. He was one of the twelve Imams whose obedience Allah(swt) made incumbent on people. He was among those who were purified from sins as the Qur’an says. He was among those whose love Allah(swt) made reward for the message. He was among those whom the Apostle of Allah(pbuh&hf) made one of the two valuable things (thaqalayn). Thus whoever cleaves to them does not go astray. He was the plant of the sweet basil of the Apostle of Allah(pbuh&hf). The Prophet(pbuh&hf) loved him and asked Allah(swt) to love those who love him.